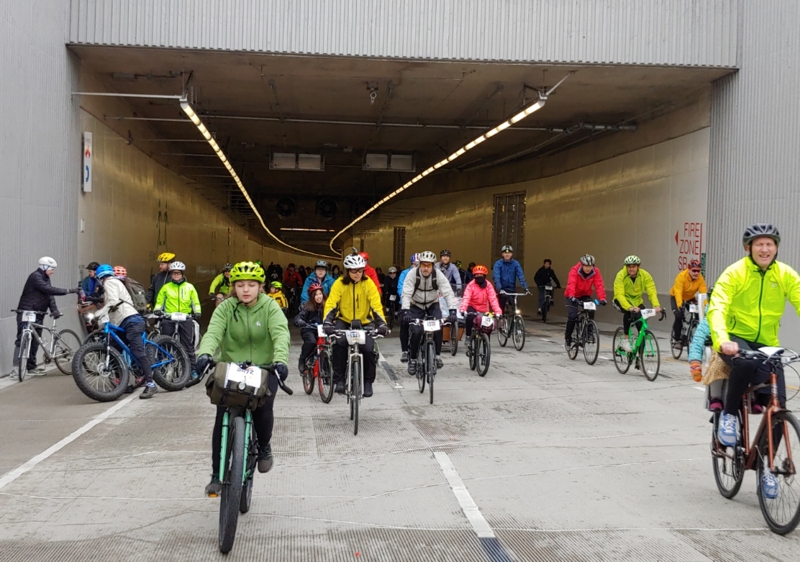 Even after the big snow dumps this week, the run and bicycle ride through downtown Seattle’s new tunnel last weekend is still memorable. Co-workers R.J. Taylor, Hayley Halstead and Kathleen Esses waited for me at the finish line; sweet! 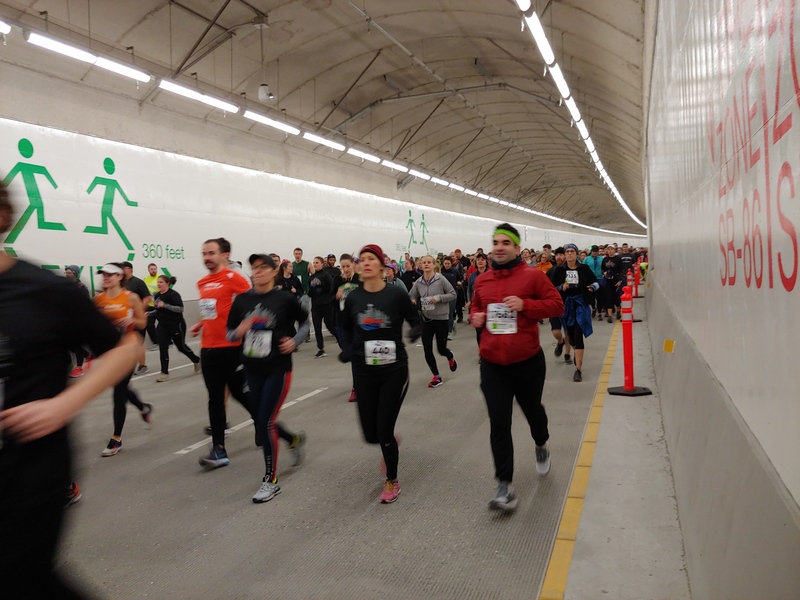 It won’t be easy to forget joining a thousand other runners from Corral 6 as we first entered the new Highway 99 Tunnel. As we raced into the white-walled, 21st century tunnel with its elegant, well-lit, high-tech ambience, screams of excitement and bliss came from many, as if they were seeing Pearl Jam for the first time. But the screaming soon stopped and the excitement began to wear off. The downhill leveled off and the run turned into a bit of an annoying climb. Suddenly, it was hotter than hell inside that contraption. And the tunnel seemed to go on and on and on, for about two miles. Relief! We were finally outside again. Good to run into the tunnel, and good to get out too! 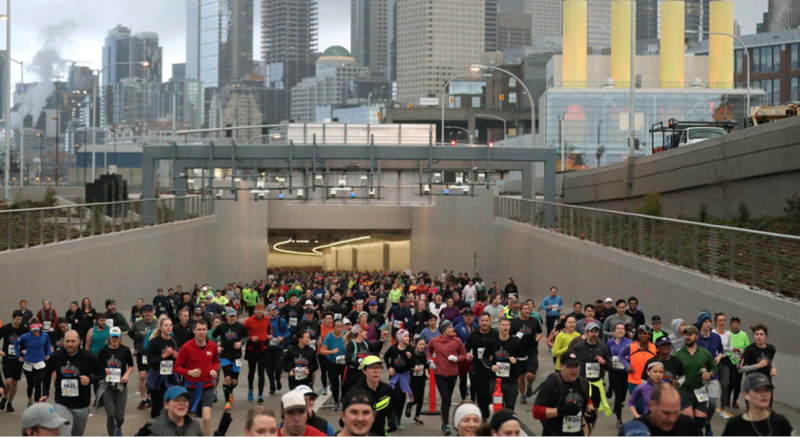 It was indeed fun running through the tunnel for the first time, and on the viaduct for the last time, in the Tunnel to Viaduct 8K Run last Saturday (Feb. 2). This was the biggest run I’ve ever done — 25,246 finishers segmented into more than a dozen corrals. Eight runners from my workplace, Allytics, took part. I made myself stop to take pictures throughout the race — something I rarely do in the middle of a race. 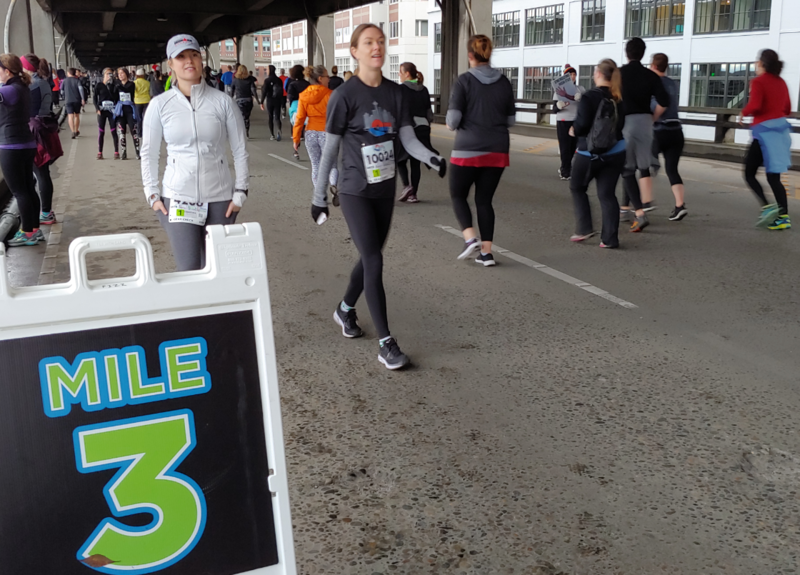 Running one last time on the Alaskan Way Viaduct, as we did later in this five-mile race, was OK; however, I’ve run the viaduct countless times before. And I’m not going to miss the big cement dinosaur being torn down because of its vulnerability in an earthquake. It was the tunnel that made the run. 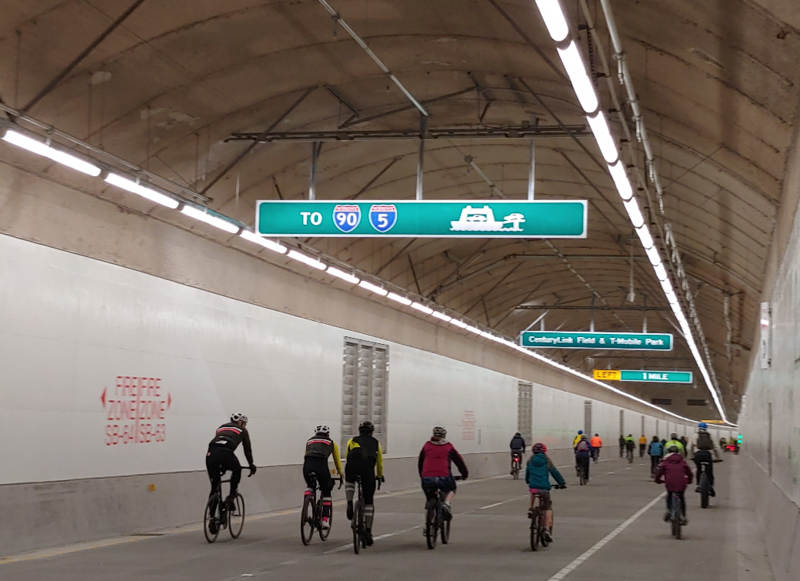 I got a chance the next day (Sunday, Feb. 3) to do the Highway 99 Tunnel bicycle ride for another, faster spin through the new tunnel. Also, a chance to say my absolute final goodbye to the viaduct. 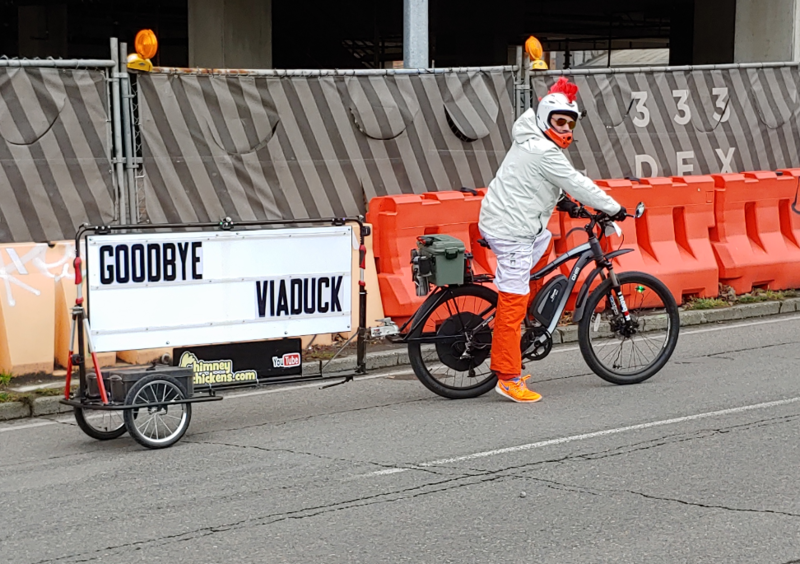 (Or “Goodbye, Viaduck,” as a display sign pulled through the ride by an Elvis-impersonator bicyclist read.) 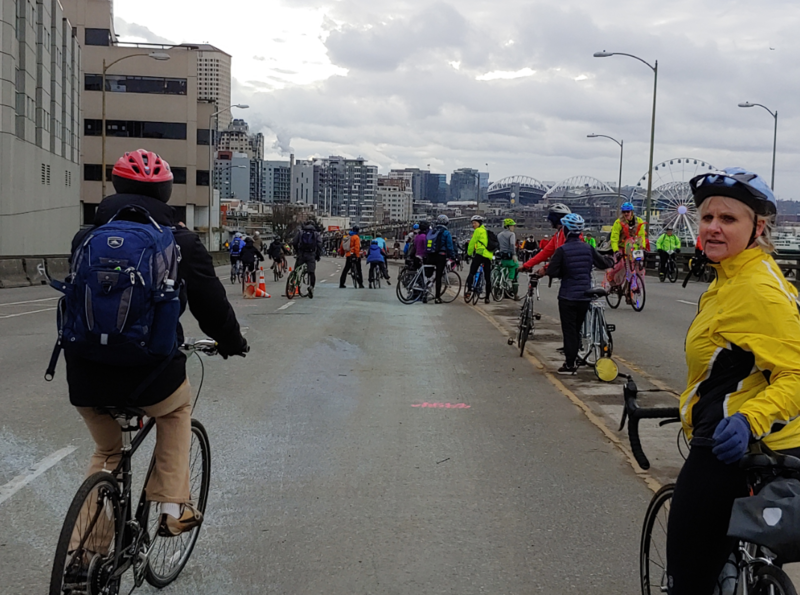 A sellout of 12,000 bicyclists — reportedly, the state’s biggest ride ever — took part in this 12.5-mile, family-friendly event. 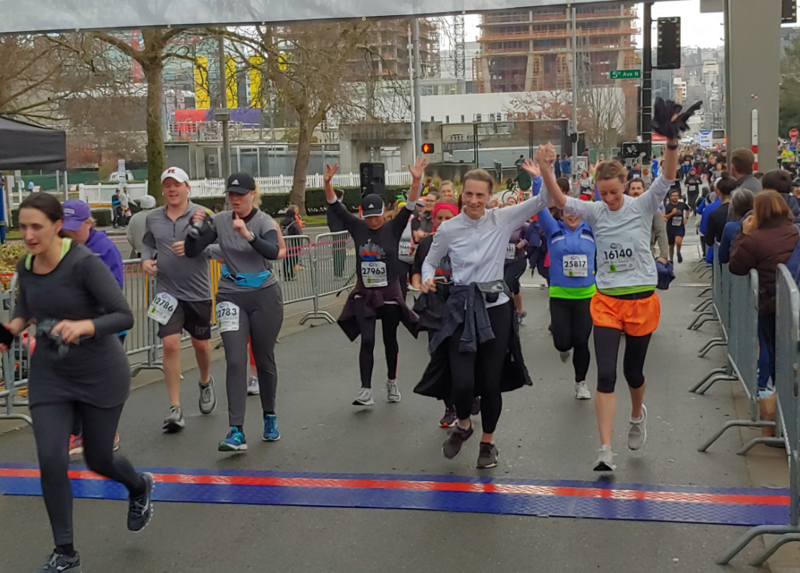 Late last year, when I signed up for these back-to-back events to celebrate the beginning of the tunnel and the end of the viaduct, it sounded like a dream fitness weekend. But as we got closer to the weekend, I caught a miserable cold. I coughed and weezed through both events anyway but have no regrets (even if my wife chided me a bit). The starting line — when my corral was finally led there after more than a half-hour of waiting for those ahead of us to start — was right in front of the new tunnel heading south on 99. 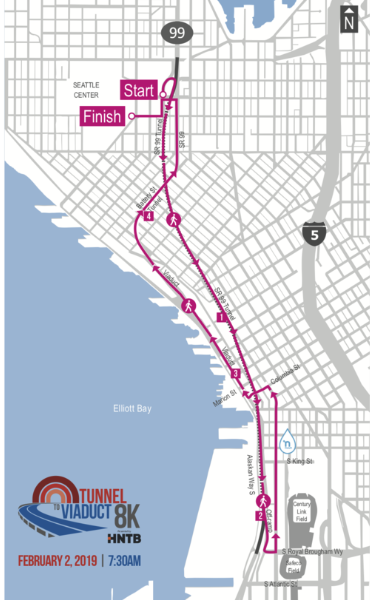 It starts in South Lake Union and takes you all the way to near Century Link Field and T-Mobile Park (formerly Safeco Field). Heading back north through Pioneer Square at the halfway point, we got on the viaduct for a swan song run and then entered the old, battered Battery Street Tunnel for a last time. The 64-year-old Battery Street Tunnel is also closing so that it can be the dumping grounds for cement waste when the viaduct is torn down in coming weeks. Sounds good to me. Compared to clean, white new tunnel, the 0.7-mile-long Battery Street Tunnel is a smelly, oily mess that has seen better days. It’s been a staple on the Seafair Torchlight Run, Hot Chocolate 5K and 15K, St. Patrick’s Day Dash, and other runs, but I won’t miss it. Enough about that tunnel. Once through it heading north, we turned off Battery to the finish line at the Seattle Center. All in all, it was a challenging run for me because of the crowds, a few hills, the stopping to take pictures, and the fact that I was still feeling sick. I finished in 1:18:23 (15:47 per mile), barely better than my latest 10K time from last August. But, hey, I finished in the top 18,000. Full results are here. A highlight of the day was having co-workers Hayley, R.J. Taylor and Kathleen Esses wait for me at the finish line for a group picture. Thanks, you guys! R.J. and Kathleen were in earlier corrals (2 and 4) and waited more than a hour, which was awesome. They also had the two fastest times among Allytics participants. Neil, Kerry Stevenson, Joe Huber, Zack Sweeten and Kiersten Walker were others from Allytics in the 8K event. Congrats to all! The 12.5-mile bicycle ride the next day, sponsored by Cascade Bicycle Club, was much less demanding but still crowded and in weather many degrees colder. We started in the same place as the run and had our “Weeee!” moment right away as we zipped downhill through the southbound tunnel before it shifted into an incline. The hill was much more manageable on a bike. The route had only a mild elevation gain, and I stayed in high gears throughout it. We rode from the tunnel past the stadiums on 99 and under the West Seattle Bridge before we turned around and came back north, this time through the tunnel northbound. Where it was hot and stuffy during the run, the tunnel was a lifesaver in the bike ride. It warmed us all up from the brisk winds and temperatures in the low 30s. After riding 8.5 miles up and down Highway 99, the bike route included an optional four-mile spin down the viaduct and Battery Street Tunnel and back. This was good for picture-taking — the Seattle Great Wheel, the ferry boats on the Sound, the Olympic Mountains in the background — so I did it. The winds began to cease. With all the stops for pictures, the entire ride took me about an hour and a half, though it was officially untimed. I was happy to get a bike ride in so early in the year, and this was not one to miss. Several friends and a few Allytics co-workers did it with me, according to their Facebook pages, but there were too many people riding for me to find anyone I knew. Great to see such a strong turnout, though. What’s next: Another bike ride? The annual Chilly Hilly ride around Bainbridge Island is coming soon, Feb. 24. I am contemplating that as well as the Hot Chocolate 5K the following Sunday, March 3. In the back of my mind is the Mercer Island Half-Marathon on March 24, which would be my 40th half-marathon. These events may be contingent on whether our Seattle area remains drenched in deep snow, whether I get another cold, and other factors. As I write this, I am stranded at my house and am unable to go anywhere due to the snow. But I look forward to more running and riding, and soon — warmer weather! Thanks for reading, everyone! Stay dry and safe. I am not an elite runner or bicyclist, though I am friends with many. I run, walk, and bike for fun and the health benefits. I can get you to the finish but probably not to the Boston Marathon (and especially not to the Tour de France). 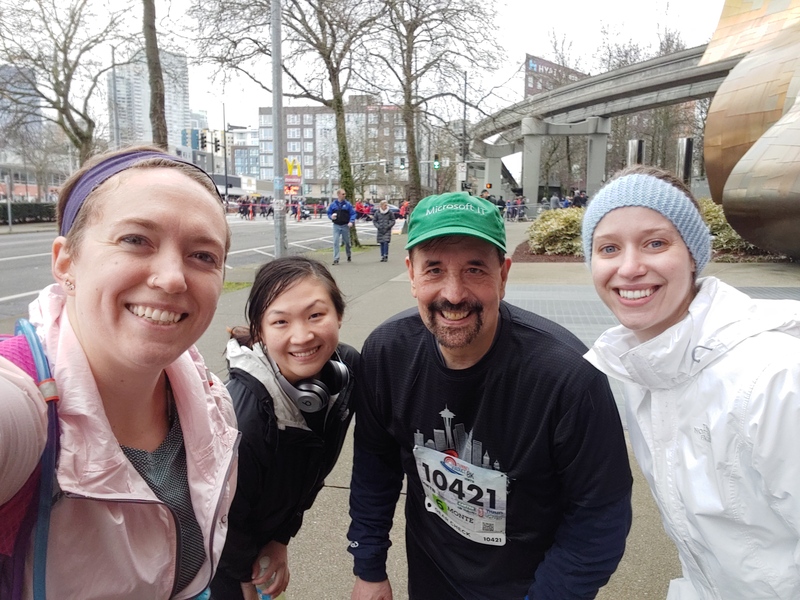 This entry was posted in 10K, 5K, 8K, Bicycling, Chilly Hilly, Mercer Island Half-Marathon, Running, St. Patrick's Day Dash and tagged 5K, Allytics, Bainbridge Island, Bicycling, Cascade Bicycle Club, Chilly Hilly, Half-Marathons, Highway 99 Tunnel, Mercer Island Half-Marathon, Running, St. Patrick's Day Dash, Tunnel to Viaduct 8K Run. Bookmark the permalink.